Pilgrim Nuclear Generating Station and Nuclear Waste Storage Facility are too similar to Fukushima. People are foolishly unaware of the problem. D I S A S T E R ! 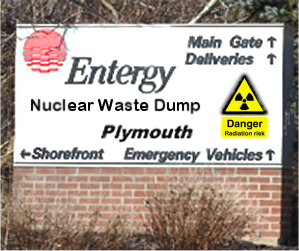 Local people are misled by the hidden & mislabeled Nuclear Waste Depository. Demand appropriate & separate labeling. Nuclear waste bottles-up the gateway to Cape Cod.